In spite of not receiving a Monarch Grant from the National Fish and Wildlife Fund this year, Walama Restoration Project is still working on collecting data about the milkweed and monarch sites in the Rigdon area. Hopefully, they’ll have better luck next year. 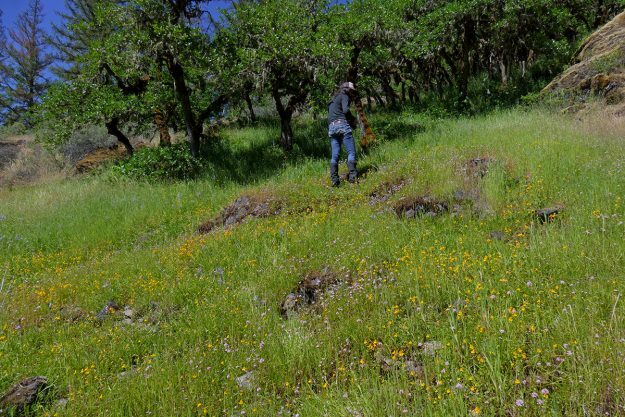 Maya Goklany is the volunteer coordinator for Walama and has already started taking volunteers out to count purple milkweed (Asclepias cordifolia) at Monarch Meadow. 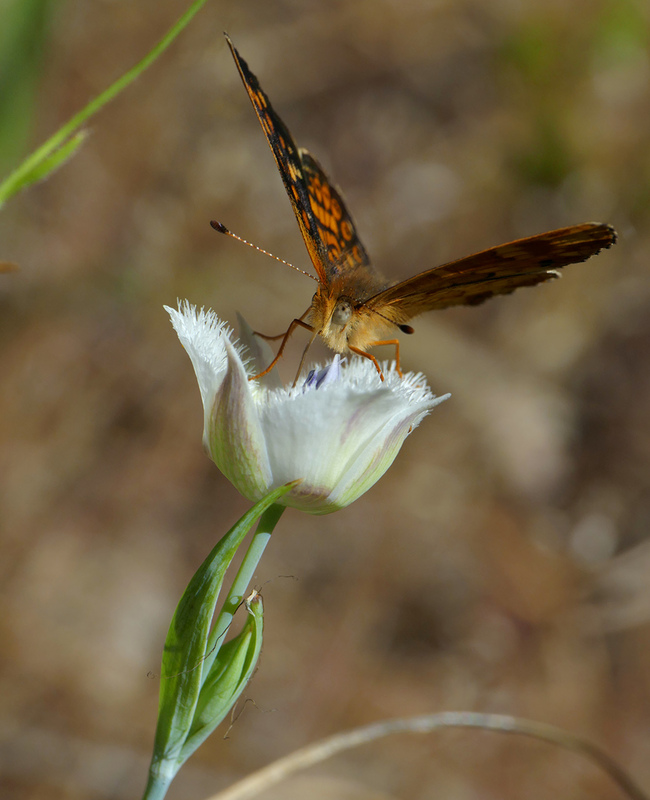 We had been wanting to go out to Rigdon together sometime to survey the milkweed and finally had a chance on Sunday, May 27. I invited Sabine Dutoit along, and Maya brought her friend Sasha. How wonderful to hang out with a great group of plant-loving women! It was a gorgeous day to be out botanizing. It was also a great day for Memorial Day Weekend camping trips, and there were more people along the lake and in the general Rigdon area than I think I’ve ever seen before. We even ran into other folks up at Grassy Glade, our first stop. But most of our day was spent enjoying the peace and quiet with only the pleasant company of each other and the butterflies, birds, and bees. We spent a while looking at the milkweed, of course, and also noted the many species of clover in bloom (Trifolium willdenovii, T. dichotomum, T. microcephalum, and T. variegatum) and two species of blue-eyed Mary (Collinsia rattanii and C. parviflora). There were lots of butterflies on the wing. While we did see a few California tortoiseshells and several swallowtails, the smaller butterflies were most prevalent. 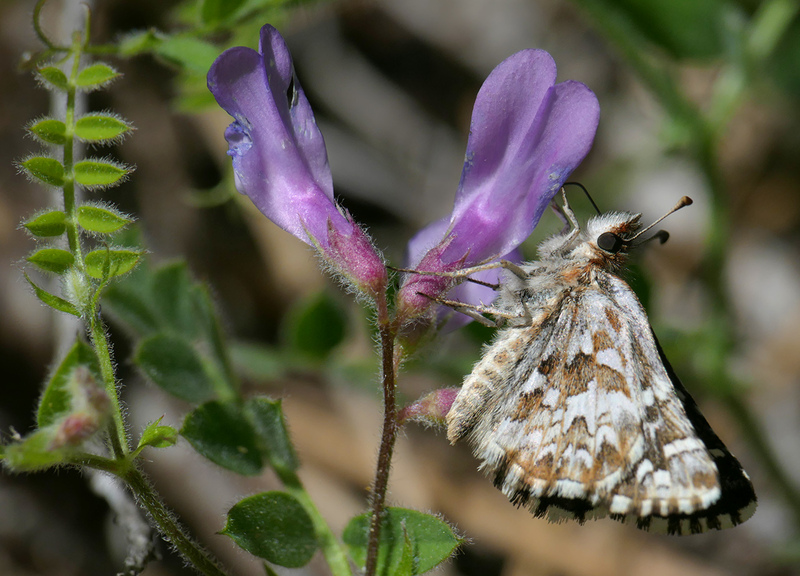 Two-banded checkered skippers were especially abundant, no doubt because there were large patches of strawberries (Fragaria spp. ), their host food plants. 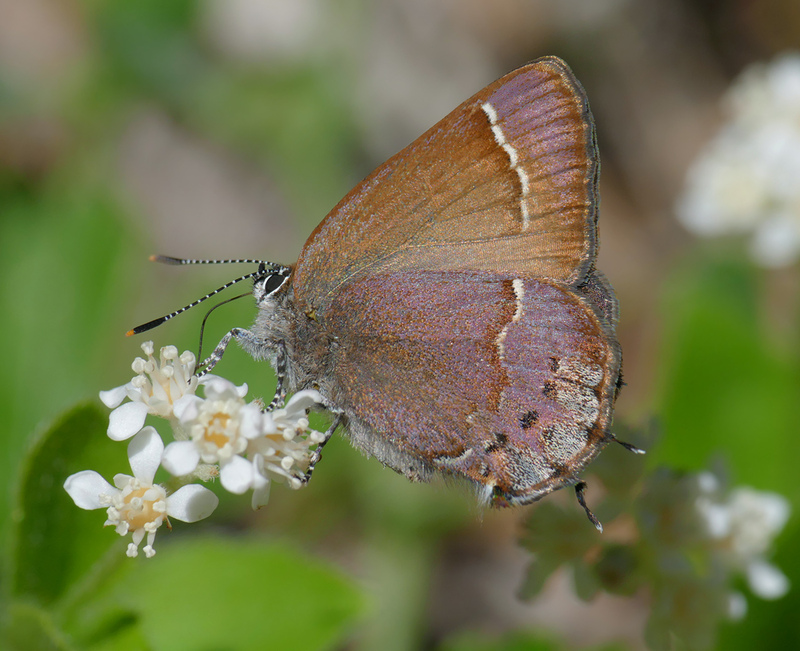 This very fresh juniper hairstreak was nectaring on the small flowers of whipplevine (Whipplea modesta). 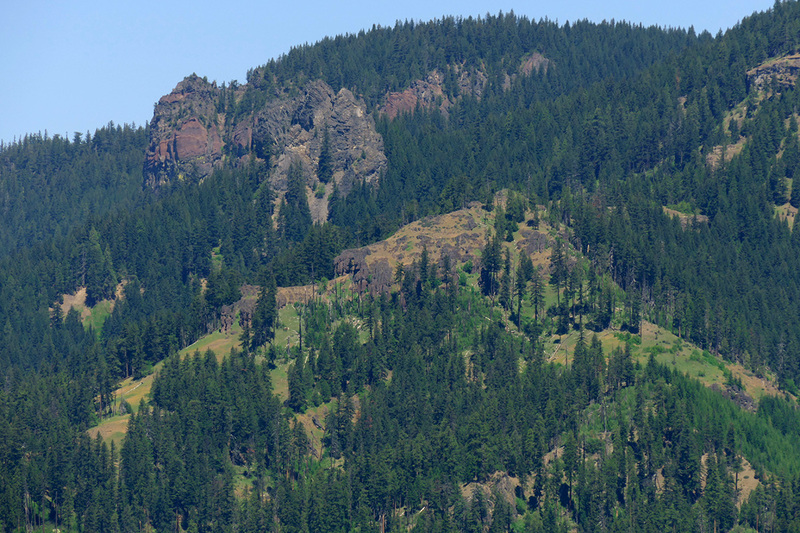 From the end of Road 262 north of Grassy Glade, there’s a clear view to the northwest of the red rocks of Moon Point (upper far left) and nearby Youngs Rock (just to its right but looking much closer than it really is due to the compression from using a long zoom lens). Lower down is the ridge Sabine and I dubbed “Gateway Rock Ridge” from the parallel dikes that feel like an entranceway when you walk between them. We walked to the end of the road to look at the view, past many water-filled(!) potholes. I was thrilled to see that the recent thunderstorms had refreshed this area (unlike on my own property, which hasn’t seen a drop of rain in almost 4 weeks). The viewpoint takes in many of the other milkweed sites, including Monarch Meadow, Jim’s Creek, and Maple Creek Meadow. We also had a great look at many of the other points of interest in the district, including Moon Point, Youngs Rock, and Mutton Meadow. I always find it really helpful to get oriented at a spot like this. It also helps me locate places I want to check out later. Neither Maya nor Sasha had ever been to the Staley Creek Gorge, so we made a stop at this special spot. 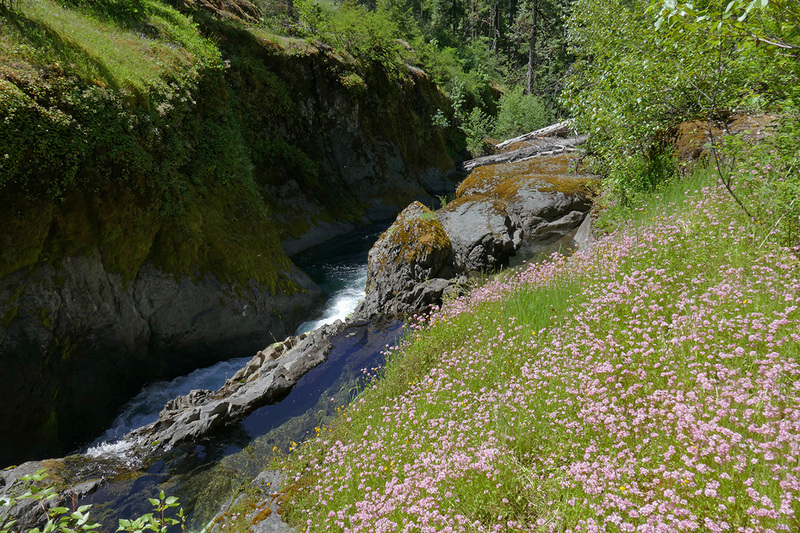 There was a great show of rosy plectritis (Plectritis congesta) on one side of the creek. I climbed down to get some photos and to look more closely at the Marshall’s saxifrage (Micranthes marshallii) I had found there a few weeks earlier (our “mystery saxifrage” from Shy Creek Meadows and Coal Creek Bluff, see First Flowers at Coal Creek Bluff). 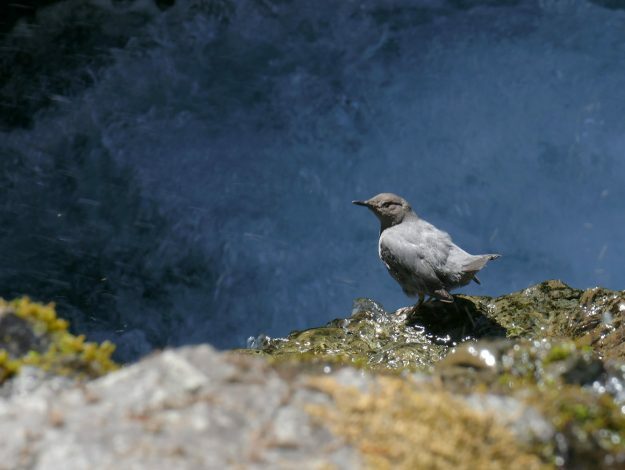 I heard some chattering whiz by me, and sure enough, it was a dipper announcing its arrival. It stopped in a few spots near the biggest falls but didn’t seem to be looking for anything in particular, just preening. We had time enough for one more stop, so I brought them all to one of my new favorite sites, “Many Creeks Meadow.” Parts of the area were quite parched, and I was a little distressed to already find a few seeds of cheatgrass (Bromus tectorum) stuck in my shoes. 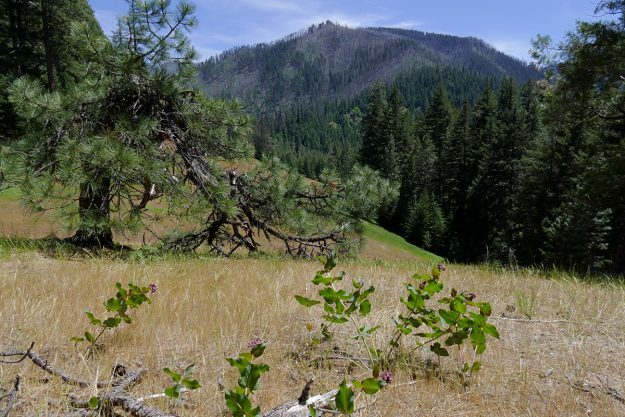 Sadly, this nasty grass appears in a lot of these low elevation meadows, presumably a result of burning. We wondered if the abundance of buckbrush (Ceanothus cuneatus) here, normally not too common in the area, was also a sign that a fire had gone through this area. Sasha spotted a piece of old fire hose on the ground—that certainly backs up our theory! Some areas were still lush and green, especially in the seeps and under the oaks. Here lots of rosy plectritis, monkeyflower, and great camas (Camassia leichtlinii) were putting on a colorful show. 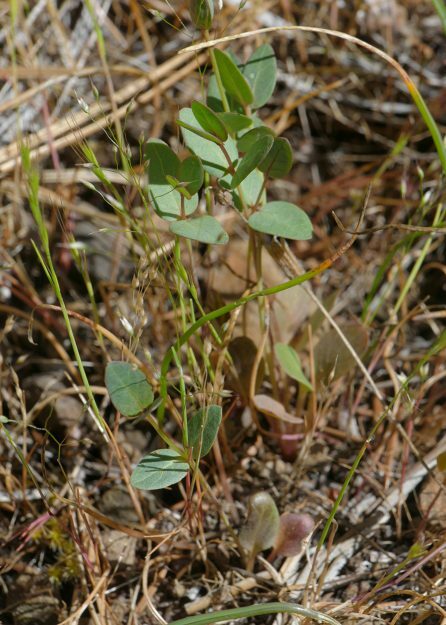 Less conspicuous were the same four annual species of clover we’d seen at Grassy Glade. Had we made our stops in the opposite order and come here in the morning, we would have been treated to an amazing display of showy tarweed (Madia elegans), but most of it had closed up for the afternoon. John and I had seen young tarweed plants on our previous trip (see More New Meadows in the Rigdon Area), but we weren’t sure which species it was at that stage. How terrific to find out it is this beautiful species! We also enjoyed patches of Tolmie’s cats ears (Calochortus tolmiei) and the fuzzy buds of the perennial woollyhead clover (Trifolium eriocephalum) that will probably be blooming in the next week or so. I kept an eye out for the geraniums we had seen emerging in April. They were indeed coming into bloom, but most of the open flowers seemed to be poking out of stands of poison oak, so it was less than ideal for getting a good photograph. All in all, it was a great day, and I hope to head out with these lovely ladies again soon.